In a film that features the last performance from one of the best actors of all time in Daniel Day-Lewis, it is hard to fathom why anyone would need more incentive to see said film beyond that. But if you need more convincing just look at the director behind the film in Paul Thomas Anderson and you could see that Phantom Thread was bound to be a worthwhile endeavor from the start. The combination of these two master artists just can’t be missed at this point. Set in the glamour of 1950’s post-war London, renowned dressmaker Reynolds Woodcock (Daniel Day-Lewis) and his sister Cyril (Lesley Manville) are at the center of British fashion, dressing royalty, movie stars, heiresses, socialites, debutantes and dames with the distinct style of The House of Woodcock. Women come and go through Woodcock’s life, providing the confirmed bachelor with inspiration and companionship, until he comes across a young, strong-willed woman, Alma (Vicky Krieps), who soon becomes a fixture in his life as his muse and lover. Once controlled and planned, he finds his carefully tailored life disrupted by love. Every bit as elegant and mesmerizing as the gowns themselves, the story has this atmosphere to it that never ceases to amaze in its almost dreamlike state of being. The narrative is magnificently tuned as well to weave in and out of this setting with a slight sense of humor and impeccable and palpable tension, romantic and otherwise. 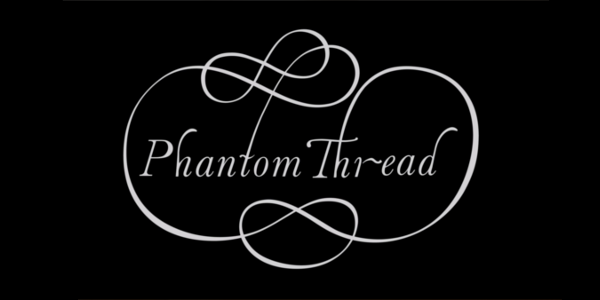 Meticulous and deliberate, Phantom Thread finds a pace that fits perfectly in line with the majesty presented on screen. If this is truly Daniel Day-Lewis’ last role in front of the camera, it is truly a magnificent way to go out. Never is there a dull moment as the seething frustration of Woodcock never truly explodes, but stays right beneath the posh exterior and Day-Lewis plays with that wonderfully. Of course, he isn’t alone as Lesley Manville has the gravitas to hang with Woodcock, even besting him at times and the actress portrays with a hidden confidence, a knowing sense of power over this lauded designer. Certainly, the most surprising, however, is Vicky Krieps, who more than anything is able to go toe to toe with one of the best actors in history and not bat an eye. All of these characters carry secrets whether its desires, feelings, or moods that fit directly in line with what director Paul Thomas Anderson is going for. Without question one of the director’s quieter films, Anderson brings an aura to Phantom Thread, one that places the audience in this sophisticated environment that oozes beauty from every inch. It takes a while to really get to the point of subversion but once it arrives, each element is scaled up bringing the tension to new levels as well and leaving the audience even more puzzled as to where it might go. Overall, Phantom Thread is just as precisely stylish and exquisite as you’d expect from a fashion world film from an auteur like Paul Thomas Anderson. Aided largely by terrific costume design and a gorgeous score from Johnny Greenwood, Anderson’s graceful touch allows the film to thrive in almost every aspect. If this is truly the last role for the talented Daniel Day-Lewis, Phantom Thread seems like the perfect way to go.